It’s finally over. I am currently in possession of all 62 amiibo that are part of the Super Smash Bros. line, which includes all of the variants for R.O.B., Corrin, Cloud, and Bayonetta. Some were bought by scalpers, but only from family members who didn’t know better. And maybe one from me, but I was desperate. I wouldn’t do it again. I promise. So, how’d this crazy collection start? Well, it started out humbly enough. The week or so after Super Smash Bros. came out, I picked up the Link, Mario and Pikachu amiibo. I liked those characters, and I wanted figures of them, so I bought them. I wasn’t a huge fan of Super Mario, so I didn’t want any of the other figures except the mustachioed man himself, but I wanted every amiibo from The Legend of Zelda that came out. The case for Pikachu was similar to that of Mario: I didn’t plan to get every Pokemon amiibo, but I figured I’d get the series’ mascot because he’s SO CUTE! For a while, I stuck to that course. Every time a new amiibo from The Legend of Zelda came out, I’d get it, but otherwise I abstained from buying any others. You see, I’d been practicing these two piano pieces for a year, and then I played them for these judges. The deal was that if they liked what they heard, they’d donate a certain amount of money to be spent exclusively on musical purchases. This could count for lessons or instruments, or even concert tickets, but you’d be hard-pressed to find a way to make an amiibo “musical.” The thing is that my mom thought I’d win around $20 or so, so in order to get me to practice more, she told me that she’d match however much I won with money to spend on whatever I wanted. But either I played really well, or these judges were really generous, because I got $500 out of those piano pieces! So how did I spend that money? Did I invest in the stock market to let them grow over decades and decades due to inflation and plan to withdraw them whenever my own children want to go to college? Did I donate it to a charity for a good cause? No way! I GOT ALL THE AMIIBOS! For a while, I’d go into a GameStop, Target, etc., and buy one or two amiibo each week. There were definitely amiibo that were reaching legendary status in terms of rareness, but there were still plenty that lined the shelves. But eventually, finding a new amiibo became progressively rare. First, it was just at the point where I would check my local game stores every few days, and I’d usually at least find one each week or so. Then, I had to check their websites to determine where they were. Eventually, I’d run the amiibo fountain dry. That’s when I turned to crime r/amiibo, one of the best places for amiibo hunters, at least in my experience. I can’t count how many times I was able to get an amiibo thanks to an announcement from someone saying that a certain retailer was getting a restock either in-store or online. Miscellaneous amiibo I own that aren’t part of any collection. It used to be part of a much larger collection, but I’ll get into that later. There was one time when I walked into a GameStop when I saw on their website that they had Super Smash Bros. Bowser in stock (mildly rare at the time), and I found a used Kirby, Fox, and Samus Aran amiibo. All three of these amiibo were incredibly rare at the time. I immediately grabbed all three and took them to the counter, and the GameStop employee told me the story of how they got there. Apparently, earlier that day, a man came in to GameStop with a ton of amiibo, crying. His wife had forced him to sell them all. I don’t know if they were trying to make ends meet or if she disapproved of his collection, but it was a heartbreaking story nonetheless. All the same, it led to a happy story for me! And then, of course, there were the amiibo launches. I usually wasn’t able to camp for the amiibo myself because of school, so I begged my mom to do it for me, God bless her. I got some amiibo as gifts, and I might have payed $5 above MSRP for one amiibo that I saw in a non-chain store, but otherwise things were steady. I also had a few friends that collected amiibo. Thanks to a friend of mine, I was able to secure a Meta Knight amiibo, and I was able to get a Lucas amiibo for another friend. With King Dedede as a gift for Christmas, I had collected every single Smash Bros. amiibo as of that time. You’ll notice that my Legend of Zelda amiibo collection is incomplete, lacking both the Twilight Princess and Majora’s Mask Link amiibo. I know; I’m a fake fan. Of course, there were more for quite a while longer. My piano war chest had long since run out, and I have almost no money thanks to these things. (I’m a teenager, so don’t think I’m prioritizing amiibo over food, although I wouldn’t put it past me.) For the final Smash Bros. wave, I had around $70, which I spent the majority of on amiibo instead of Splatoon 2 because I knew I wouldn’t be able to buy the amiibo later. The only time when my amiibo collection actually shrank was in anticipation for the Nintendo Switch and Breath of the Wild. I had been waiting for Breath of the Wild to release since its premiere trailer from when I was 13 years old, and there was no way in hell I was going to spare any expense for this game. I wanted both the Wii U and Switch limited edition (I said the Wii U version was for my girlfriend to play, but it was secretly for my collection), all of the Breath of the Wild amiibo, and the gosh darn Nintendo Switch itself. I sold my Wii, a ton of games, and a bunch of other stuff, but it still wasn’t enough. Thus it was that I sold my entire Super Mario Bros. amiibo collection, as well as two of my Yarn Yoshis. (Blue and Mega had to stay.) The Smash Bros. collection was, however, off-limits. And there you have it. The amiibo saga had its ups and downs, but at the end, I have all 62 Smash Bros. amiibo. While I think everyone would prefer amiibo to be easy to find in any store, the sheer amount of amiibo out there makes that a tall order for Nintendo to fill, try as they might. Yet despite all of the hardship that amiibo’s scarcity causes, it sure is nice to have the full collection on display. 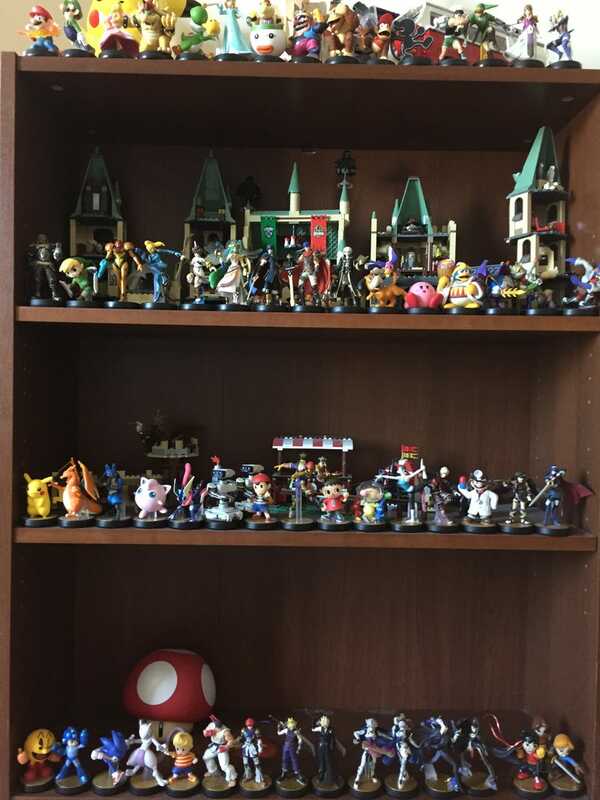 It’s something that I’m proud of, and I hope to take my amiibo collection with me to wherever I go for the rest of my life. But I’m sure they’ll add more whenever Smash Bros. Switch becomes a thing.